Brace yourselves because Mercury is about to go retrograde for the third time again this year! It all starts on August 30th and will last through September 22. During that time period we can expect disruptions in the main areas that Mercury controls, which includes travel, communications, and learning. But first, here’s a little clarity on what it all means when someone says something along the lines of Mercury being retrograde. Chances are you’ve heard it countless times before but when someone mentions that “[planetary body X] is in retrograde” do you know what it actually means? The answer is quite simple, it means that the planet will appear to move backwards in its orbit through the sky! In the most basic terms retrograde is defined as “directed or moving backward,” in the Online Oxford Dictionary. Astronomy and astrology use the word to encompass how all the planets appear to be moving around the sun as compared and relative to the Earth. As such, a planet which is said to be in retrograde will appear to be moving backwards, as if it’s going in the wrong direction, even though it’s not. A point of comparison is that we’re used to planets and their satellites moving in direct, aka prograde, motion from west to east. That type of path through the sky appears normal, it’s what’s expected, and so we don’t bug out nearly as much when Mercury is prograde. 1. Don’t buy big ticket, expensive items! Oftentimes issues arise with the pricey goods and gadgets that consumers end up purchasing during retrograde periods. Perhaps the bargain is too good to pass up, and it later turns out that’s because the item is broken or defective in some way. It’s best to hold off until later to spend your money and a good rule of thumb to follow is don’t buy unless you absolutely must. For those unavoidable purchases make sure you get something from a reputable seller that is either guaranteed, insured, registered, under warranty, or whatnot. Save the receipt, packaging, and paperwork as well in case you do in fact end up needing it! 2. Don’t ignore your finances! No one enjoys going over bills and loans but if you’ve been putting off checking your accounts and all that good stuff lately, then do it now. During Mercury retrograde our minds and brains tend to be more willing and able to go over and examine any financial information that needs reviewing. Whether you need to refinance or pay off a loan, plan a budget, balance your checkbook, it will all be easier to get done when Mercury is in retrograde. 3. Don’t switch careers or begin a new job! While landing a new job is exciting and opportunity is hard to pass by, you may be better off pushing it back or declining it all together. Mercury retrograde has a peculiar way of messing things up. Even the most routine, expected, seemingly fair things get turned upside down and this is especially true in the realm of employment. 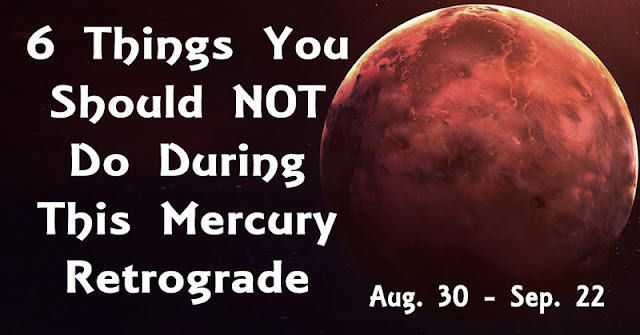 Maybe your new boss will turn out to be unbearable, you won’t get the benefits or pay expected, the work load will break you, the company will fold a couple of months later, there’s lots that could go wrong so try to avoid starting a new job at this time and wait for Mercury to be prograde again! As if traveling isn’t already a huge pain in the neck, during Mercury retrograde it’s ten times worse. There’s often a noticeable uptick in the amount of delays, cancellations, lost bags, reservation mix-ups, and missed flights or connections. Whether you plan on traveling by plane, car, train, or bus, expect service interruptions of any and all kinds. Mercury has a strong connection with travel so when it goes backwards it sends even the best laid travel plans haywire. If you absolutely must travel, you’d be wise to have your itineraries and alternative plans in order. Get travelers insurance if possible and triple check all the times, details, and reservations you’ve made. 5. Don’t sign a contract or close on a sale! During Mercury retrograde the way people think and comprehend things becomes altered. They may be all for signing on the dotted line when it comes time to close, but soon afterwards they will be questioning their decision and re-thinking all the options. They may try to get out of it all together or breach their duty and leave you taking a big hit. In case there is no way around entering into a contract, be extra careful no matter who you may be dealing with. Make sure you fully understand and double check all the fine print, know all the terms, conditions, exceptions, and every possible detail of what you’re about to sign and agree to. In the end, a signed writing is the one key piece of evidence that can make or break a contract, and make it fully enforceable against you down the line. On a final note, after September 22nd Mercury won’t be in retrograde anymore until December 19th so until then good luck!